I nearly missed this opportunity! As we suffered through one of the coldest periods in recent memory, wonderful photos of normal waterfalls transformed into unique ice sculptures, carved only by the fastest of the moving waters began to show on Social Media everywhere. I had a Sunday all set up to get out into the far southwest NC, and a rough list of 10-12 waterfalls that I planned to visit. The problem that I encountered, that put my ice falls trip in jeopardy, was warming temperatures. Saturday, the day before my trip, temps rose above freezing for the first time in nearly a week. It was a hard freeze too, with two nights getting below 0 in many locations. The Sunday that I was there, the mercury shot up well up into the 50’s touching 60 while I was briefly in South Carolina. That type of temperature change is well….just life in the Carolinas. We are constantly caught in the middle of Winter’s struggle between cold arctic winds from the northwest, and warm winds from the southwest that can easily spread temps into the 60’s and 70’s. The difference in ice from my first stop at Looking Glass Falls in Brevard, and my last stop of the day at White Owl Falls was amazing. One was still nearly frozen, while the other just had some remnant ice on the sides. 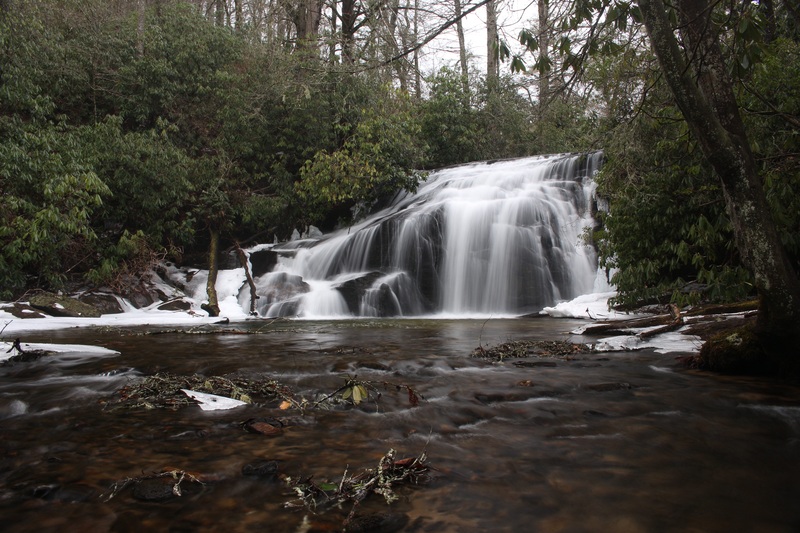 The same waterfall…White Owl Falls that an online photographer friend Thomas Mabry posted in Facebook that was nearly solid in ice, had melted some 80 percent in less than 2 days. Just doesn’t seem fair…lol. I couldn’t get too upset. The conditions for shooting waterfalls on this day were at times, as perfect as I have had the opportunity to shoot in. A solid cloud cover blanketed the sky throughout, with just a peak of sunshine here or there. The water flow was excellent all around, and I feel I have my best photos of White Owl Falls to date…ice or not. After Looking Glass, I came back to Brevard. Staying north leads to the Parkway, and Canton eventually. I had no intentions of hitting the BRP today as I anticipated closures from the recent weather. Once back in Brevard, I headed west on US 64. This is where most of the good waterfalls lie, although Dupont can be reached by taking 64 east or 276 south. The last time I was at Dupont, I counted 77 people on Triple Falls, on what seemed to be an average day. Unfortunately, I find myself avoiding that place, not intentionally though. I love the waterfalls and trails there, but a weekday trip for sure! 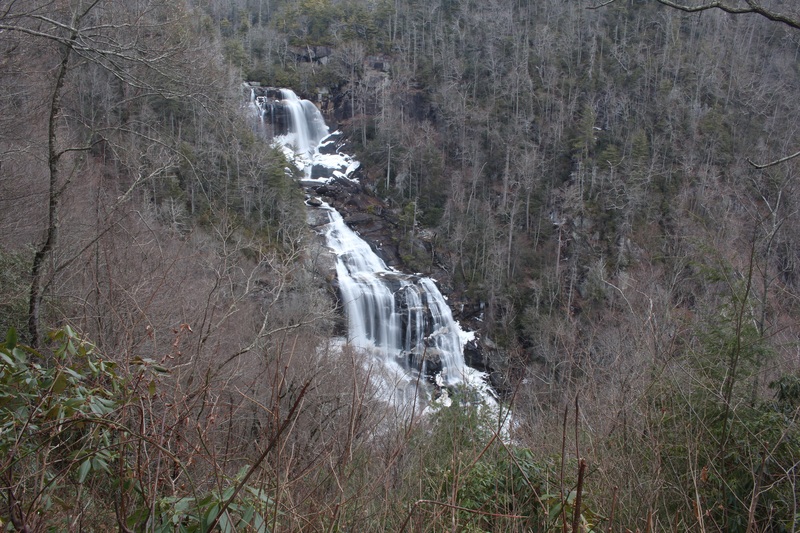 I have just recently taken a trip to the waterfalls along NC 215, (report still to come), so that was out. My vision had me going south on US 178, into South Carolina briefly, taking the beautiful highway 11 west for awhile, and coming back north on highway 130 into North Carolina, where it becomes NC 281…. A very well known stretch of highway for waterfall enthusiasts. Back at the intersection of NC 281 and U.S. 64 in Sapphire, NC, it would be decision time…..keep west for Cashiers, Highlands, and Franklin, or head back east towards home… Only time would tell. 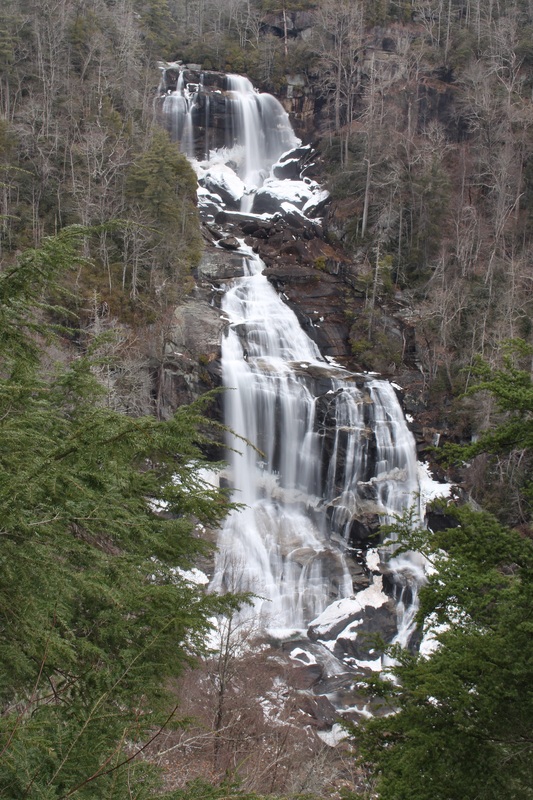 The first time I drove down US 178, I went through a very nice small town called Rosman, and it was to see this waterfall, Eastatoe Falls. It was new to me in 2014 and this Ice Falls trip is my 3rd time here now. 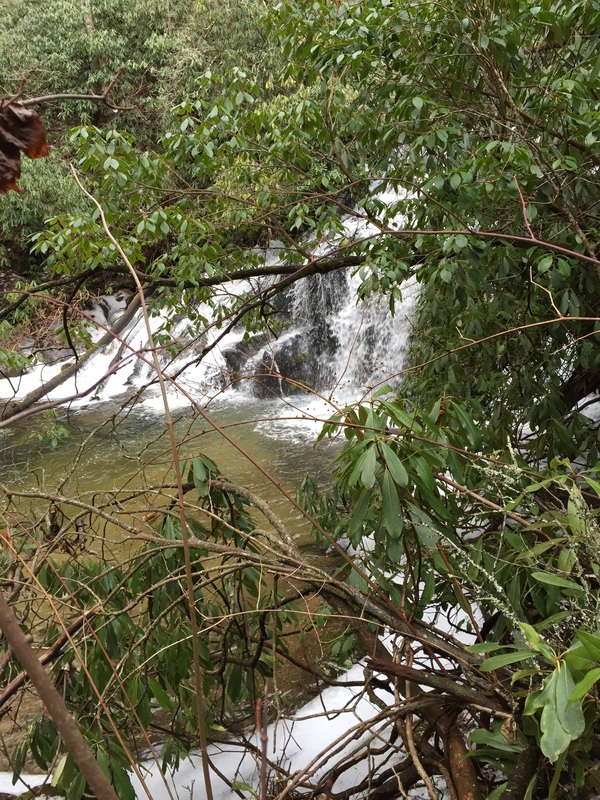 This is a very beautiful waterfall on private property that is 3.4 miles down US 178 from US 64. A right turn on a driveway that goes between 2 small ponds will get you there. There is also a green sign that says “Meadowview”. I have yet to meet the owners, but I would love to thank them for their hospitality of allowing visitors to visit this gorgeous waterwall. They have taken time to put signs on their property, of where to park, and a short trail with steps built for accessibility. If you come here,…….I don’t even need to say it. Back to the waterfall, it was approaching mid day by now and the snow melt was in full force. There was still a lot here, making the creek crossings trickier than usual. Once I got the the base, what I thought was solid, was just snow and ice that got my right foot quite soggy. That photo op was out. I have another spot here I like that shows the falls in a good setting but hides the bottom somewhat. It was gonna have to do on this day. It wasn’t safe further up, just yet. From here, I kept on US 178 south. As it heads towards Pickens, SC, there is quite a bit of curvy roads going down the mountain, back up and then back down. 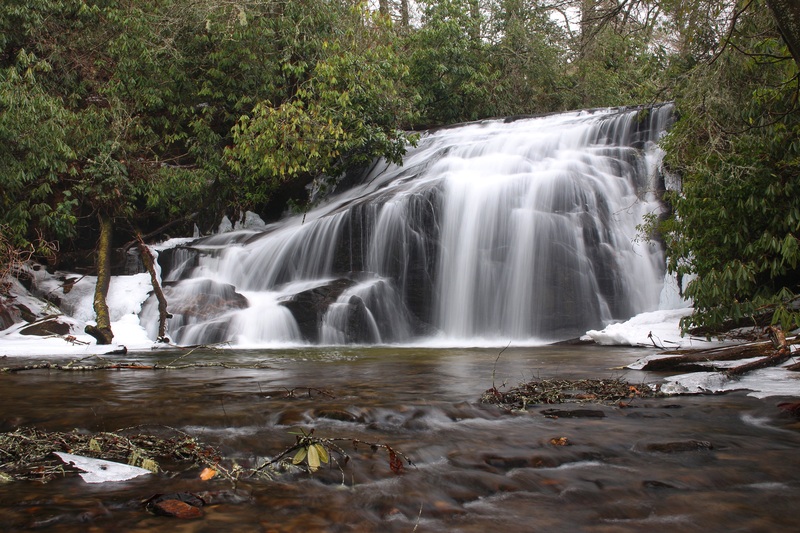 Twin Falls on Reedy Cove Creek was my next destination. Another new waterfall for me in 2014, I was excited about this one as it instantly became one of my favorites last year. To find Twin Falls, look for a sharp right turn on Cleo Chapman Road, There will be a little shack called Bob’s Place on the corner. Accross the road will be another interesting site called the “Roadkill Grill”.﻿ They must be closed for the season. Follow Cleo Chapman downhill for awhile. It will soon bottom out and cross Eastatoe Creek. Just past that, Cleo Chapman makes a sharp left, where Eastatoe Community Rd joins. Take a right on this road, following a short ways through a small residential area. Look for a right turn on Waterfalls Rd, take it and follow it to the end. It is a short drive and ends at a parking area. There is a nice wide trail leading into the woods here. Look for this sign. After a short walk, the trail ends at a very nicely built and placed viewing deck. The view of this creek splitting to form two separate waterfalls here is just an amazing scene. Getting a picture of it all just does not give it justice as to how large it is. When you see the 2 falls, look at the full grown tree in the middle standing out. It looks really small but is not. ﻿﻿ ﻿﻿ ﻿﻿ ﻿﻿ ﻿Wow! One thing I did notice here different was the huge lack of snow and ice from the first 2. Maybe they didn’t get nearly as much down here or maybe the afternoon warmth was really doing some damage, but the ice was definitely on its way out down here. It is still a beautiful place and will be back to see it when it’s covered in spring green. It was now beginning to get into the later afternoon hours. I was going to have to wrap this up soon I was afraid. I knew I would be passing White Owl Falls just a short ways up the road. It was pretty close to the highway, so I felt I could squeeze one more waterfall in, and make it a day at 5. The trick to finding this one is knowing where to park and where to enter the woods for the short scramble to the Thompson River. There are no signs for it. Either you know about this one and are looking for it or you will pass right by every time. That’s what I did for my first 5 years of waterfall searching. It’s a favorite now, and this will be my 3rd visit since last summer. If coming north on NC 281, look for a small turn off onto Brewer Rd. This is the same spot where the trailhead is for High Falls, Big Falls, and other unnamed Thompson Falls. From Brewer Rd, either park here or go down NC 281 a short ways back south to some parking opportunities along the highway. Don’t go far, keep Brewer Rd in sight. There is a guard rail on the other side of the highway, and a spot where the concrete drainage ditch turns down towards the river, this is the point of entry and is the most challenging spot to find for most White Owl Newbies. On this day it was marked teal. This is a short trail, but it can be hard to follow and tricky. 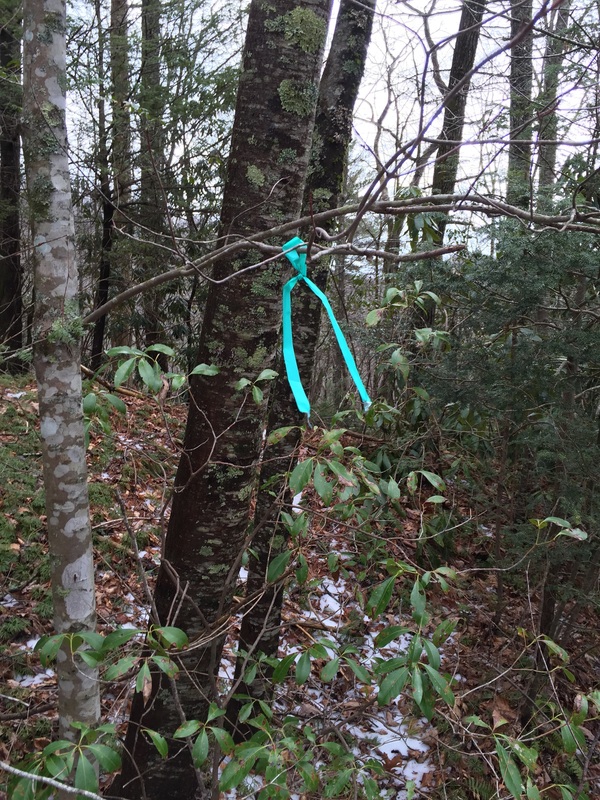 The trees were freshly flagged with teal markings today but my challenge was getting down to the river on a trail of packed snow and ice. 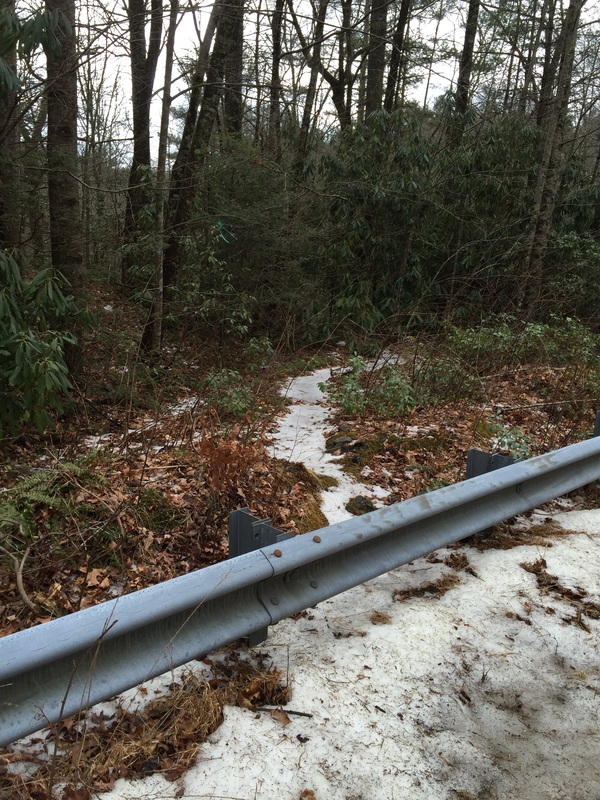 It was impassable in places and I found it safer to work my way off trail. Once down the final descent, this was no mistake. The most beautiful 16 foot waterfall I know of was lined perfectly on each side with ice. It was far from the photos I had seen from just 2 days ago when it was nearly covered, but it was still beautiful. After this it was surely time to begin my trek back east. Going west to Dry Falls woul have probably added 2 more hours to the trip, and I had to be at word at 5 am the next morning. Great post and super photos. Thank you Steve! I would like to have you come along on one of these trips! Thank you for providing such clear directions. This would be a long weekend for my husband and I. Awesome to see these falls in the wintery dress! 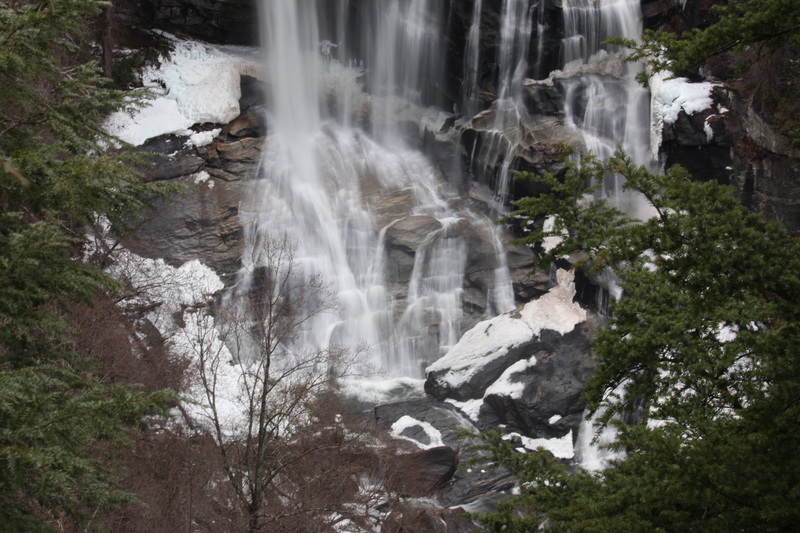 I am heading to Lake Toxaway for a weekend stay next weekend….can’t wait to hike to some more waterfalls! Thanks for posting about the little known falls. Some people have a bucket list, I have a waterfall list and White Owl Falls is going on it.